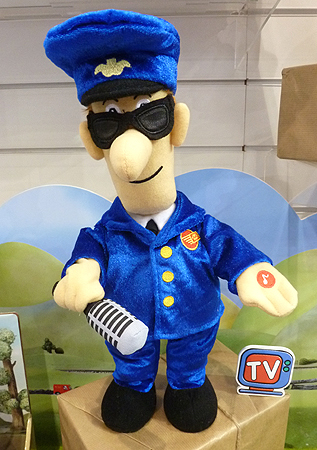 Singing and Dancing Postman Pat, or Showbiz Pat, is a large plush Postman Pat figure with sound effects and animatronics. Squeeze Showbiz Pat’s hand to see him singing and dancing as seen in Postman Pat The Movie. In the movie, the singing voice of Postman Pat is played by … Gary Barlow! This Show Business Postman Pat even has cool black shades and a microphone to help him look the part. Character’s Singing and Dancing Showbiz Pat plush figure is first released in Spring 2014.